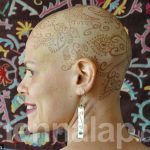 A henna artist from Idaho is using her talents to help children with cancer. Dana Bellefeuille, with Henna and Cake, a skin care service in Coeur d’Alene, helped 7-year-old cancer patient Alex feel like a real-life princess when she drew a “henna crown” on her head, Fox 28 reported. Alex shaved her head after she was diagnosed with leukemia. Henna is a dye made from the henna plant. Artists use the dye on skin to create temporary tattoos. “It’s a very healing art,” Bellefeuille told the news outlet, adding that being able to use her artistic talent to help Alex was a “touching and emotional” experience. Bellefeuille drew Alex’s henna crown for free, according to Fox 28.